Our Christmas Concert on the 13th December was at Torrisholme Methodist Church on Norwood Drive, Morecambe. We had a traditional Christmas programme which included Christmas music arranged by Rutter, some popular carols for everyone to sing, and Wendy Sharrock as soloist provided a variety of songs finishing with 'O Holy Night' accompanied by the society members. As usual we had a favourite audience piece – the Twelve Days of Christmas – with a sting in the tail to catch out those not watching the conductor. 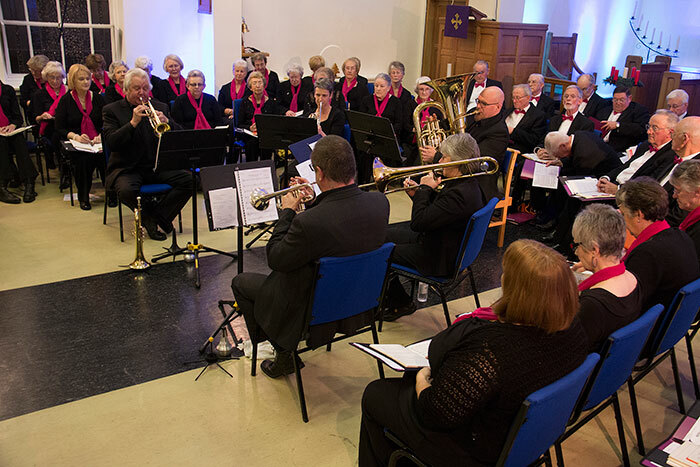 Our Spring Concert in 2018 was at Christ Church URC on Broadway in Morecambe. We included in the programme the 4th Movement of Mendelssohn's 'Hymn of Praise'—the only choral movement in this, his second symphony. We welcomed back soloists Emily Robinson, Kate Noble and Ederic Ibbotson. In the second half of the programme we presented a collection of 'Opera Lollipops': well-known choruses and solos. In May 2018 we were the guest choir for the Morecambe Promenade Orchestra at 'The Platform' in Morecambe. We sang Opera Choruses with the orchestra, under Howard Rogerson, and also items which form part of 'Songs and Dances from the British Isles' by local composer Julian Davies. Other items in the work are orchestral. The concert ended with a 'Last Night of the Proms' selection. The entire programme was well received by a capacity audience. Our annual Christmas Concert was on Thursday December 14th at Christ Church URC, Broadway in Morecambe. The programme of Christmas music included 'A Gospel Christmas' (a set of Spirituals arr. by Daryl Runswick) and other items of familiar Christmas music, including 'O Holy Night' and Carols for Everyone. We were delighted to welcome back Wendy Sharrock as soloist. We also presented a similar programme at Leighton Hall on the 10th of December. This was a charity concert in aid of the new Dementia Hub set up at St John's Hospice in Lancaster. Our two concerts in May this year, at Casterton Church on May 14th and at Christ Church, Broadway in Morecambe on May 20th, featured two works new to the society's repertoire. The major work was the 'Requiem' by Mozart, which he started only shortly before his death. He completed some of the work himself, but a substantial amount of the work had to be finished by Sussmayer, sometimes from sketches left by Mozart, and sometimes completely from scratch. In any event, the work is one of THE great choral works both to sing and to listen to. These songs are settings of poems by Frances Thompson, Robert Herrick, Christina Rossetti, and that most prolific of all poets, Anon. For this concert we welcomed as soloists for the first time alto Kate Noble and soprano Emily Robinson, whilst we welcomed back Ederic Ibbotson (tenor) and Brian Lancaster (bass), all of whom are well-known in local choral circles. As usual our accompanist was Richard Bromley, and we were conducted by Martin Webster. Handel's The Messiah mixed with other Christmas music including popular carols when Carnforth and District Choral Society joined up with the Broadway Brass Quintet for their Christmas concert at URC, Christchurch, Broadway, Morecambe on Thursday, 15th December 2016. The choir performed selections from The Messiah before joining the brass quintet for Christmas music. Born in Halle, Germany in 1685, George Frederic Handel moved to London in 1712 taking English nationality 15 years later. The Messiah was composed in 1741 and had its first performance in Dublin the following year. The words are an English scriptural text by Charles Jennens, largely based on King James Bible. Handel saw The Messiah as being for modest vocal and instrumental performances, it later also being adapted after his death for large choirs and orchestras. Joining the Carnforth choir was soprano, Lorna Sherrin who has sung with the choir on several occasions. Musical director and conductor was Martin Webster with Richard Bromley as accompanist. 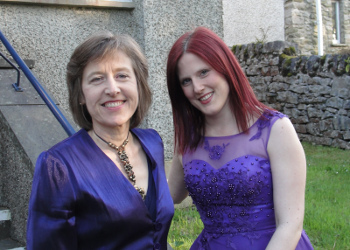 Country songs from Frostiana and extracts from Mendelssohn's Elijah were the highlights of Carnforth Choral Society's spring concert at Christchurch, Broadway, Morecambe on Saturday, 7 May 2016. The concert was repeated at Holy Trinity Church in Casterton, Kirkby Lonsdale, on 15 May 2016. Frostiana is based on poems by the American poet, Robert Lee Frost who was noted for his realistic depictions of rural life and his command of American colloquial speech. It is a piece for mixed chorus and piano composed in 1959 by the American composer, Randall Thompson. The piece was premiered in Amherst, Massachusetts – a town associated with Robert Frost. Felix Mendelssohn started work on Elijah around 1830 and the piece was gradually developed over the following 15 years. It tells the story of Elijah as told in the Book of Kings with Psalms and was commissioned by the 1845 Birmingham Festival. The German version was translated into English by the poet and composer, William Barthlomew. For the Society's spring concert the choir was joined by soloists Lorna Sherrin, Ederic Ibbotson and Brian Lancaster. 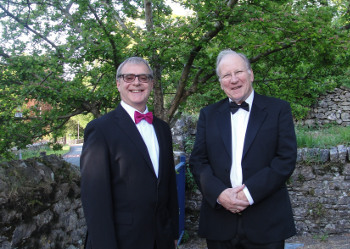 Conductor was the Society's musical director, Martin Webster with accompanist Richard Bromley on piano. Christmas Concert at Christchurch Broadway, Morecambe. Main work was Christmas Cantata by Geoffrey Bush. Guest artist was Alexandra Lowe. Also audience carols with Broadway Brass quintet. We returned to Christ Church, Broadway, Morecambe in May 2015 for our 50th anniversary concert to perform Coronation Mass by Mozart and Feel the Spirit by Rutter. Soloists were Lorna Sherrin (Soprano), Wendy Sharrock (Mezzo Soprano), Ederic Ibbotson (Tenor) and Brian Lancaster (Bass). Conductor was Martin Webster and accompanist, Richard Bromley. The Coronation Mass (Mass No. 15 in C major, K. 317); composed in 1779, is one of the most popular of Wolfgang Amadeus Mozart's settings of the Mass. This setting, like the majority of Mozart's mass settings, is a Missa brevis, or short mass. The KV 317 mass appears to have acquired the nickname "Coronation" at the Imperial court in Vienna in the early nineteenth century, after becoming the preferred music for royal and imperial coronations as well as services of Thanksgiving. The mass is in 6 parts: Kyrie, Gloria, Credo, Sanctus, Benedictus and Agnus Dei. JOHN RUTTER's "Feel the Spirit"
The heritage of the African-American spiritual has fired the imagination of composers, performers, and audiences for more than a hundred years. Each generation has produced interpretations of many kinds, yet, curiously, rather few composers have combined the resources of soloist, choir, and orchestra. John Rutter was inspired by the vocal artistry of Melanie Marshall to build a set of spirituals crafted to her personal style, partnered by choir, with the orchestra to supply an extra dimension of colour and emotional depth. Feel the Spirit received its concert première in Carnegie Hall in June 2001. CARNFORTH CHORAL SOCIETY WAS 50 THIS YEAR! 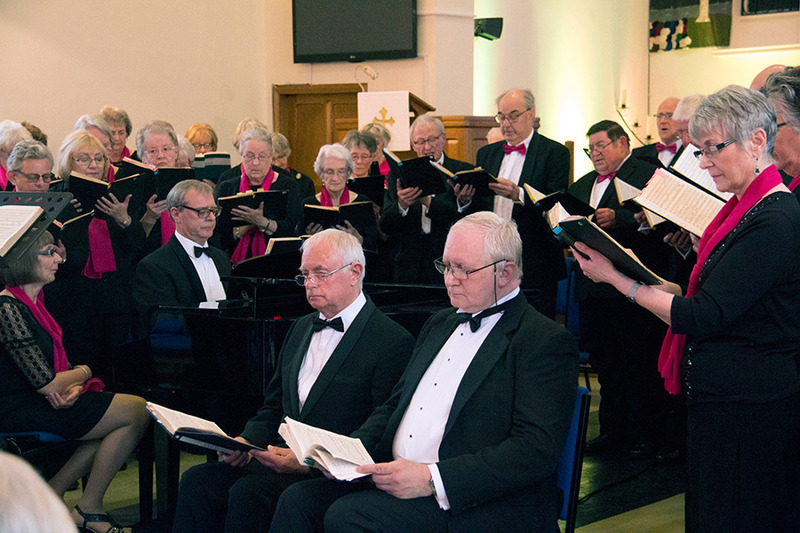 Our Spring Concert in May 2015 marked the milestone of 50 years as a Choral Society. We have increased in size over the years from small beginnings to over 60 members. We now know that a Carnforth Choral Society existed in 1915 and lasted until at least 1935. Like many other organisations we suspect that it was disbanded for the Second World War with the present Society reformed in 1965. Robin McIlveen (2004-2011) and Martin Webster (2012--). Arkholme Village Hall and Christ Church, Morecambe. Peterson’s 3 Cantatas; Faure’s Requiem; Stainer’s Crucifixion; Haydn’s Creation; Gilbert & Sullivan’s Yeomen of the Guard, H.M.S.Pinafore, Iolanthe, and Abba selections. Over the years we have collaborated with The Goodwood Singers; Lancaster Male Voice Choir; Flexitime and the Red Rosettes. Home for the Hover and Breath for Life. 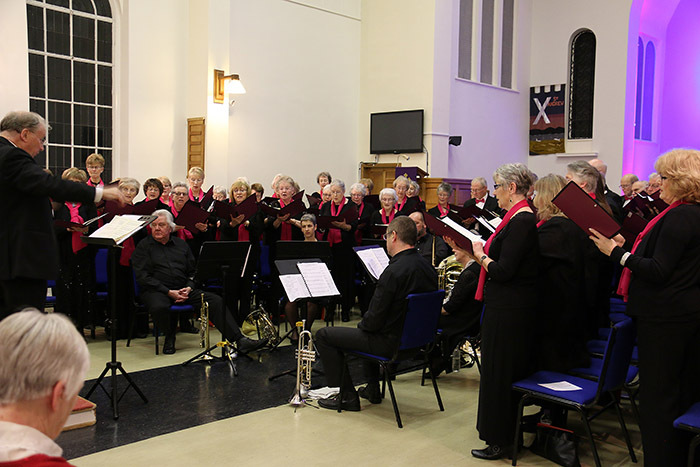 The traditional ‘African Noel’ and Gustav Holst’s “Christmas Day”, a choral fantasy based on old carols, were among the highlights of Carnforth Choral Society’s Christmas Concert at Christ Church, Broadway, Morecambe on 18 December 2014. The audience carols were accompanied by the Brass Quintet and soloist for the evening was Morecambe based mezzo soprano, Wendy Sharrock. 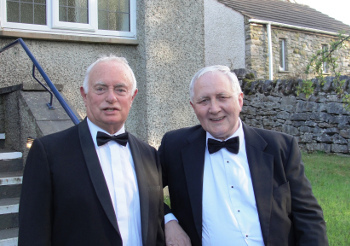 Conductor and musical director was Martin Webster with Richard Bromley as accompanist on the piano. Broadway Brass joined Carnforth Choral Society for the Christmas 2014 concert and returned for our 2015 and 2016 Christmas Concerts.